You will feel like you’re on top of the world in Ocean Crest. This beautiful oceanfront home is well-equipped with everything you need for a fun-filled family getaway! With an elevator to the ground, a pool deck with no stairs, and a handicap-equipped bathroom, this home is perfect for those with limited mobility. 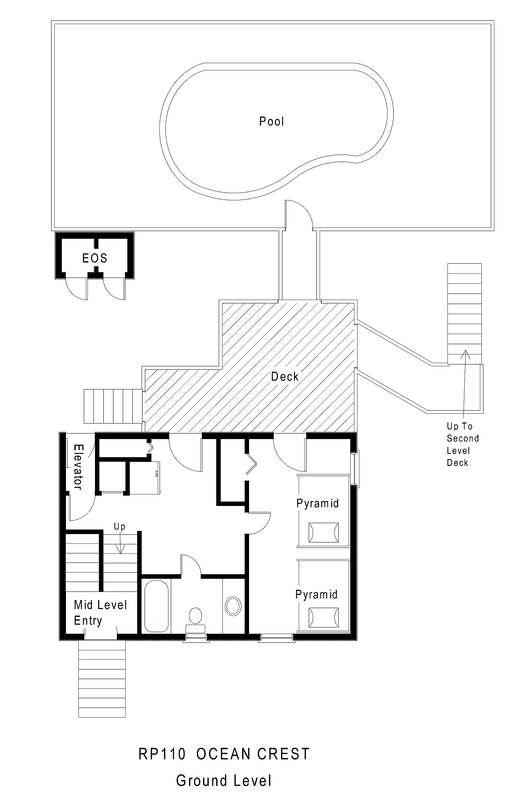 The first floor has a bedroom with 2 pyramid bunks, a door out onto a shaded deck, and a TV with DVD player and game console with games. An extra refrigerator on this level is perfect for the kids to hide their midnight snacks in. A full bathroom completes this level. 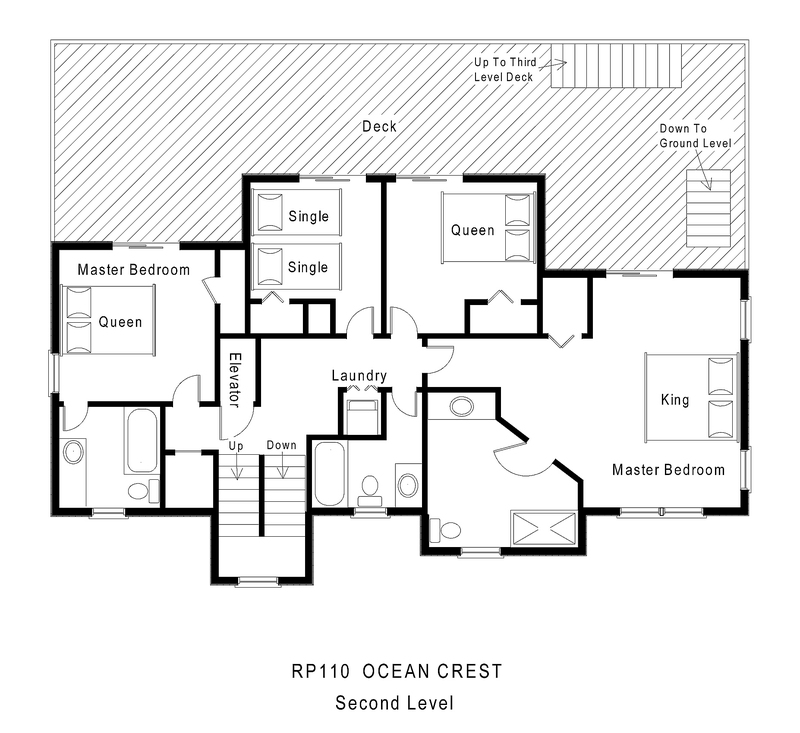 The second floor has 4 bedrooms. A large king master bedroom boasts a handicap-friendly bathroom, complete with shower seat and enough room to maneuver a wheelchair. This bedroom has a TV and DVD player as well as a slider to the spacious shaded deck with ocean views. A queen bedroom and a bedroom with 2 single beds share a bathroom off the hallway and both have sliders as well. A queen master bedroom has a TV and DVD player and another slider out to the breezy deck. The laundry area is also on this level. 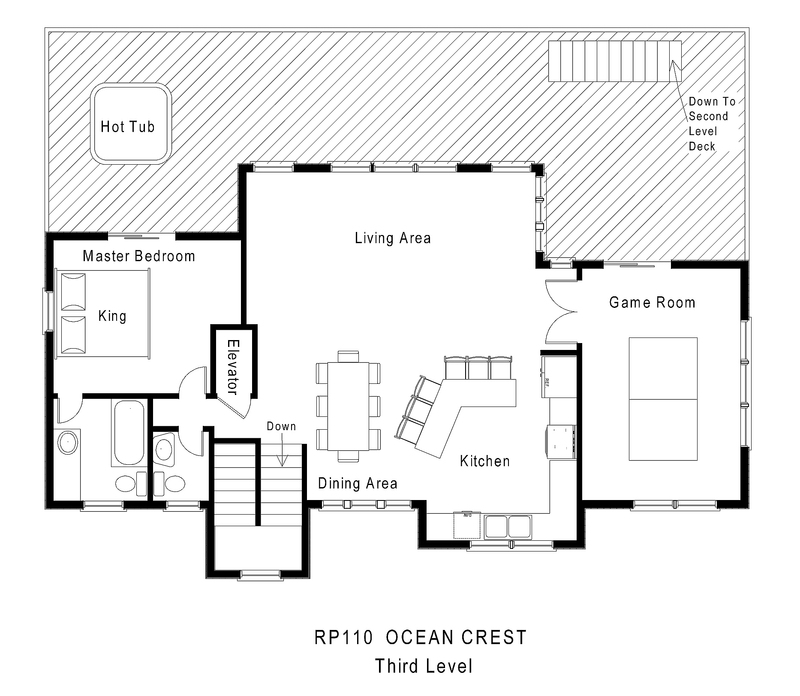 The third floor has an additional king master bedroom with TV and DVD player. The slider from this bedroom opens onto an oceanview sundeck with a bubbly hot tub for your relaxation. Kick back in comfort in the tastefully decorated living room, complete with TV, DVD player, stereo, surround sound, and gas fireplace. Whip up something tasty in the amply supplied kitchen, and take in a family meal around the large dining area table. With a high chair and baby gates provided, all ages can have a ball. Family fun is never short at hand with a game room off the kitchen with a TV and combination ping-pong/pool table and another door to access the roomy deck. A half bathroom completes this level. Relax in the sun around the pool deck or head over to the beach. Located just a short distance from local restaurants, shops, and the Rodanthe Fishing Pier, Ocean Crest is the spot to be for your next Hatteras Island vacation! We are staying in the ocean crest property from April21-28th and I am just wondering if the beds will have linens. I know two years we brought linens and didn't need them. I just wanted to see if that was the case again. For the 2018 season, this home provides Seasonal Gold Linens, which are available May 26 - September 7, 2018. No linens are provided outside of those dates. I am looking at the pictures. How do you get out onto the beach? This is an ocean front home, so you just walk behind the house. There are openings in the sand fence that you can walk through. My family and I are staying in this house this summer for a week and I was wondering if the pool was salt water or chlorine?? Very nice house.<BR>Grate views.<BR>Love the elevator. We stayed here the first week in November for a sisters reunion. It was the perfect getaway to relax and unwind. The view was beautiful. There were 7-10 of us at any given time and we had plenty of room for everyone. There's Not much open this time of year so we did a lot of cooking, the kitchen was very nicely equipped. <BR>I would definitely recommend this house! I recommend this house totally. Awesome place. Ocean Crest is a beautiful house with a perfect view of the ocean. The dunes are low enough you can see straight out to where the waves break. The pool is huge and the kitchen had everything we needed, we were shocked there was even a crockpot. We will for sure be returning in the future. Lots of stairs, so it's good that there's an elevator. very nice house, clean, great ocean views!